Back in June we posted the first trailer for THE WOLF OF WALL STREET, which I can easily say is one of my favorite film trailers of the year. The use of Kanye West’s “Black Skinhead” in the background and the quick cuts of seemingly random yet totally interesting action made it rather mesmerizing. I actually remember going to a screening where it played, and you could feel the intensity wash over the audience. Since then the release date became a subject that was widely questioned, but finally it appears Paramount has chosen a Christmas opening for the project, thankfully not pushing it to 2014 like originally thought. Now we have a new trailer to sink our teeth into, and while not as loud and catchy as the original, it’s still rather effective and equally intense. Check it our below and tell us your thoughts in the comments. Director Martin Scorsese’s working relationship with Leonardo DiCaprio goes back over 10 years now, starting with GANGS OF NEW YORK in 2002, followed by THE AVIATOR in 2004, THE DEPARTED in 2006, and SHUTTER ISLAND in 2010. 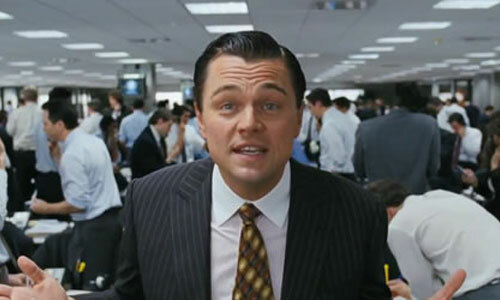 His latest collaboration is based on the book by Jordan Belfort. What we see more of in this new trailer is Jonah Hill, complete with big fake teeth and a thick accent. The cast also includes Jon Bernthal, Jon Favreau, Cristin Milioti, Ethan Suplee, Kyle Chandler, Spike Jonze, Shea Whigham, Rob Reiner and Jean Dujardin.